The Justice Department and the U.S. Environmental Protection Agency on Monday announced a $425 million settlement with two companies to reduce air pollution at six petroleum refineries in the West. 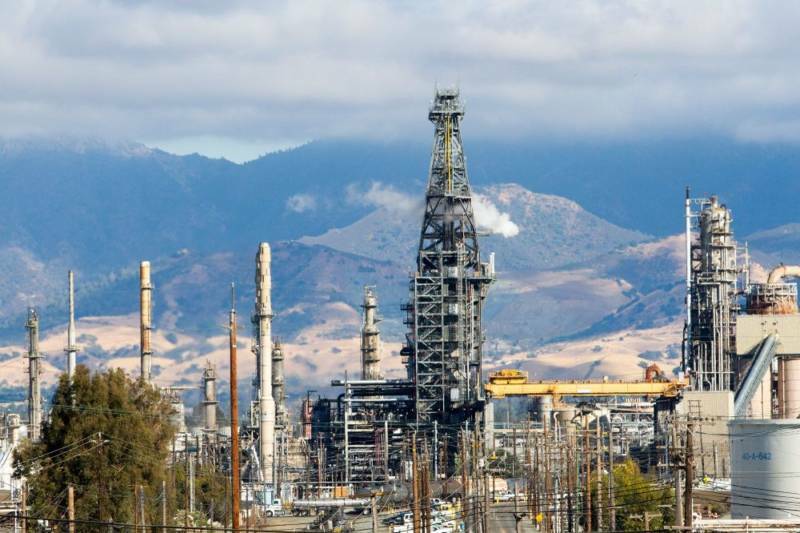 The agreement with Tesoro Corp. and Par Hawaii Refining resolves alleged violations of the federal Clean Air Act at several refineries including one in Martinez, California and requires installment of new equipment to control emissions. The settlement covers five refineries that Tesoro operates in Kenai, Alaska; Anacortes, Washington; Salt Lake City, Utah; Mandan, North Dakota; and Martinez. It also covers Par Hawaii's refinery in Kapolei, Hawaii. Under the consent decree, the companies will spend about $403 million to install equipment to control carbon dioxide, sulfur dioxide and other emissions at the refineries that process crude oil into gasoline, diesel fuel and other products. At the Martinez Refinery, about $24 million will fund pollution control equipment and $1 million will go toward compressed natural gas school buses to replace old diesel school buses in Contra Costa County. Federal officials say the settlement will improve air quality for people and the environment because the installed equipment will reduce pollutants, including an estimated 47,000 tons of carbon dioxide annually. Leaks, flares and excess emissions from the refineries emit dangerous air pollutants known or suspected to cause cancer, birth defects, and seriously harm the environment, the officials said. Tesoro will spend about $12 million on three environmental improvement projects, including the school bus replacement in Contra Costa County. The San Antonio, Texas, company will also pay a $10.5 million civil penalty. The settlement "provides important reductions of harmful air pollution in communities facing environmental and health challenges," said Assistant Attorney General John C. Cruden of the Justice Department's Environment and Natural Resources Division. Tesoro said in a statement Monday that it agreed to settle the case by making the investments to reduce emissions but did not admit any violations. The company added that most of the projects to reduce emissions have been completed or are in progress, with about $75 million of work left to do after the end of this year. "We are dedicated to operating in a safe and responsible manner that reduces the impact on the environment," said Keith Casey, Tesoro's executive vice president of operations. Phone and email messages left with Par Hawaii Refining were not immediately returned. The company bought the Kapolei refinery from Tesoro in 2013. The agreement was filed Monday in U.S. District Court for the Western District of Texas, along with the complaint filed by the federal government, the states of Hawaii and Alaska and the Northwest Clean Air Agency that regulates air quality in northwestern Washington state. The states will get $2.4 million of the $10.5 million penalty, with the rest going to the federal government. In addition to the new school buses, Tesoro will also install infrared cameras at four refineries to detect leaks and spend about $11 million to install equipment on a furnace at its Salt Lake City refinery to reduce nitrogen oxide emissions.